Purpurnelke (Purple Pink) is a textile design made from cut paper and gouache. It features entangled grapevines set amongst boldly-colored flowers that resemble Japanese fans, combined in a striking pattern indicative of non-Western influence. 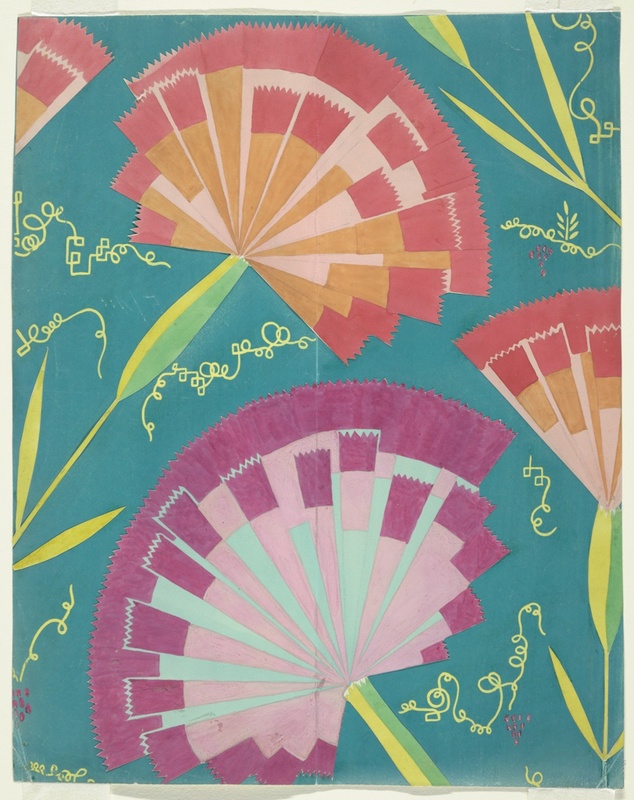 The designer Felice Rix-Ueno (Austrian, 1893–1967) created the blossoming flowers and their straight stems from cut paper; the flowers were most likely pasted onto the sheet after they were used as a template for other designs of the same pattern. Seven works in Cooper Hewitt’s collection share a nearly identical composition, shedding light on the Rix-Ueno’s design process as she experimented with various color palettes and combinations. Felice “Lizzi” Rix-Ueno was born Felice Rix in Vienna, Austria, in 1893. She studied at the University of Applied Arts in Vienna under the architect Josef Hoffmann (Austrian, 1870–1956). Hoffman was a founding member of the Wiener Werkstätte, a firm devoted to instilling beauty into everyday objects for the domestic environment. The Wiener Werkstätte helped elevate the status of several early 20th century female designers, including Rix-Ueno. During her years with the Wiener Werkstätte (1917–1932), Rix-Ueno primarily designed textiles and ceramics, but she was also a talented painter and experimented with painting glass, boxes, and enamel. In 1925, Felice Rix met Isaburō Ueno (1892–1972), a Japanese architect then working for Josef Hoffman’s firm. Ten years later, in 1935, the couple settled in Kyoto, Japan, where, following World War II, Rix-Ueno would teach at the Kyoto School for the Arts. However, long before she relocated to Japan, Rix-Ueno’s fascination with Japanese motifs is evident in her designs for the Wiener Werkstätte. In Purpurnelke, the blooming flowers evoke the graceful extension of a Japanese folding fan. The intertwining tendrils, several supporting a cluster of grapes, showcase a dynamic design of sinuous swirls that transform into interconnected squares, a motif often seen in Japanese architecture and design. When viewed together, Felice Rix-Ueno’s textile designs make evident her meticulous approach to the craft. Exploring numerous color palettes for the same design, Rix-Ueno examines how different color combinations create varying effects, even when the pattern remains constant. Despite her history with the Wiener Werkstätte, Rix-Ueno is today most recognized in Japan, with the National Museum of Modern Art, Kyoto owning over 775 of her works. Rachel Pool is a graduate student in the History of Design and Curatorial Studies program offered jointly by the Parsons School of Design and the Cooper Hewitt, Smithsonian Design Museum. She is a Fellow in the museum’s Drawings, Prints & Graphic Design Department.